I found some yellow beetroot at a grower’s market in the city today and decided use it for the delicious Russian/European soup borscht. 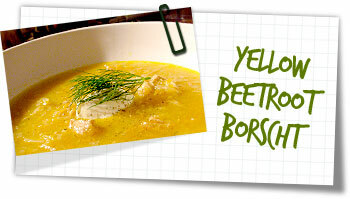 Instead of the vivid ruby red colour of traditional borscht, the yellow beet created a vibrant yellow soup. You can of course, use ordinary beetroots for this recipe. Don’t ask me why I felt like eating this at this time of year! The temperature outside in Sydney was about 30ºc and I was sweating like a pig. Maybe after 5 years, my brain still hasn’t adjusted to the southern hemisphere’s opposite seasons. This is a dish best served hot in a cold climate. It will warm every inch of your soul, not to mention looking very colourful and impressive along the way. If you’re in a hot country, pop on the air conditioning to it’s lowest setting, slip a jumper on and tuck in. Place the pork and the caraway seeds in a large pan and cover by about 1cm with water (about 1 litre) Bring to a boil then reduce the heat to medium low and simmer for 1 hour until the tender. Remove the pork and chop into bitesize chunks. Return back to the pan with the liquid. Melt half the butter in a large frying pan over a medium heat. Fry the carrots and onion for about 4-5 minutes. Remove from the pan and tip into the soup pan, add the remaining butter to the frying pan and fry the beetroot for 5-7 minutes – add this to the soup pan along with the cabbage and potato. Add about 600-700ml water. Bring this to the boil then reduce the heat to low and simmer covered for 2-3 hours on the lowest heat, stirring occasionally. Check for seasoning then serve. Serve on a winter’s day with a dollop of sour cream and a sprinkling of fresh dill alongside a massive wedge of bread.